Mare By the Sea is pure Southern Living Charm; from the large, deep metal-roofed, wrap around porch to the private deck accesses for the 5 master bedrooms. Two bedrooms with private, raised sitting areas. Ground floor has a bedroom with 2 double beds and bath, a large rec room with 60" HDTV, surround sound, a wet bar and a separate game area with Foosball & Air Hockey. 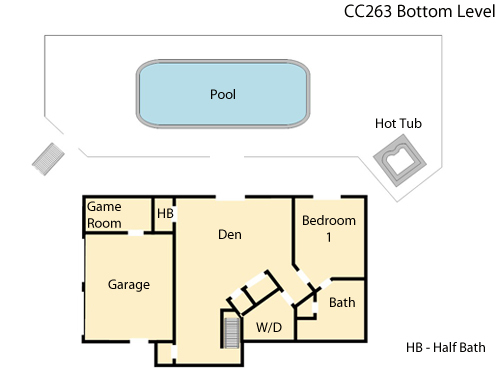 There is a half bath convenient to the private 28 x 14 pool and hot tub area and an outside shower. Only a step away is an elevator to help with all your luggage and groceries. Currituck Club amenities including reduced greens fees & priority tee times. Elevator, screened porch, jetted tub, 5 Master bedrooms, Den/Study with sofa sleeper,TVs, DVR's, Blu-Ray player, DVD players, 2 gas fireplaces available mid September through the end of April, surround sound with speakers throughout house, outside on decks and the pool area. Each room has control for speakers. Large kitchen with gas cook-top, 2 dishwashers, large pantry, double oven, reverse osmosis water system for kitchen and icemakers and the refrigerator. Foosball Table, Air Hockey, high chair & Pack-n-Play, 2 wet bars, 2 dishwashers, outside shower, decks, and a grill. Middle level has a large owner's master bedroom with king bed and fireplace, glamour bath and raised sitting area. A dramatic 2 story great room with fireplace, TV, powder room, wet bar, separate dining room, eating area off the kitchen (for 8), 5 bar-stools at the kitchen counter and a screened in porch to enjoy the sunsets or your morning coffee (seating for 10). Third level includes 3 master bedrooms. There is a separate den with a pull out sofa and computer desk. Shed dormers add an 'Outer Banks' touch. 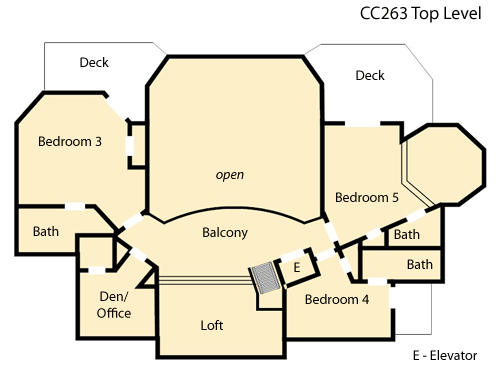 Top floor has 2 sitting areas; one at balcony above the great room and another a few steps up in the sunny loft. Accessibility Information:*If there is specific information you need to have regarding access for a person in a wheelchair or with limited mobility please let us know. We are happy to go out to any home and take photos and measurements for you. First Level: The entry way has a 1-1 1/2 inch lip through the garage doorway. The elevator goes to all floors. Two full size beds with handicap friendly bath. The master bedroom has a 34 inch french door to the outside pool area. Tiled bathroom with roll in shower with hand rails and seat. The toilet has a hand rail and there is an open area under the sink. Mid Level: Hardwood flooring. 34 inch doorway to the screened in porch. 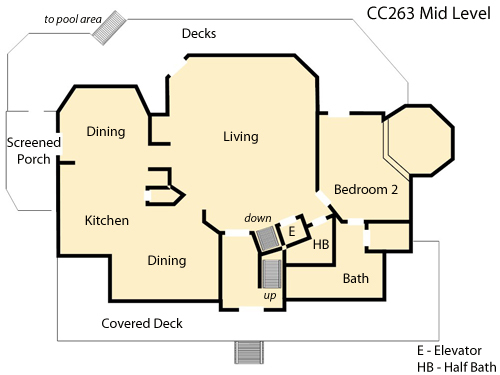 Open and spacious living, dining and kitchen area. Beautiful home and wonderful development. Everyone was so friendly and very accommodating to our needs. We plan on coming back next year for two weeks, cant wait!